The Hindu marriage symbolizes the physical and especially the spiritual union of man and woman. The rituals of the Hindu marriage ceremony, highlight the interdependence and the complementary nature of man and wife relationship. The maathorupahan or Arthanareeswarar, the half male half female representation of Shiva and Shakthi, in Hindu cosmogony emphasizes this ideal of man and wife relationship in such union. Venerated even as Shiva and Shakthi, the bride and groom sit elevated in a space the priest sanctifies for divine intervention in the solemnization. The priest and guests traditionally sit on the floor as equals with the idols of divinity. As tradition would have it, all events related to the wedding are usually on a day and at a time rendered auspicious by planetary positions. 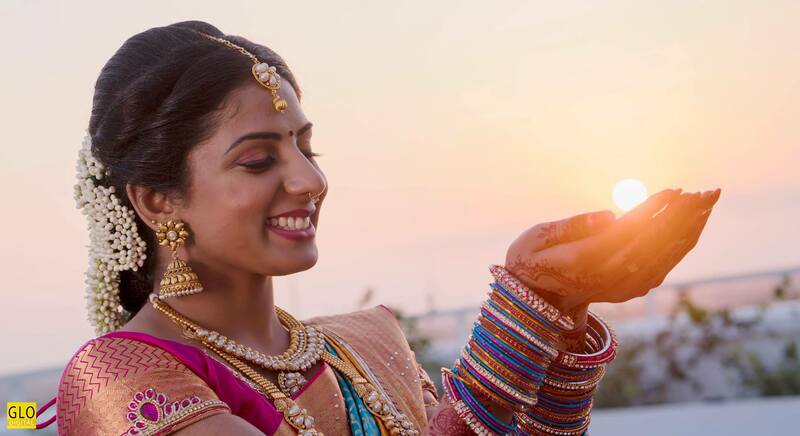 Though Hindu marriages are traditionally arranged, marriage by consent, the bride and groom choosing one another, is also a trend. Nitchaya thampoolam which follows the choice is the Hindu engagement. Thampoolam or Vetrilai (betel leaf) and its complement Paakku (betel nut) are ceremoniously exchanged with other gifts at the bride’s residence announcing the betrothal. A significant occasion a few weeks beofre the wedding is the Ponn Urukku ceremony attended by parents and the elders at which the groom presents a gold coin to the family goldsmith for its ritual meltdown to fashion the Thaali – the bridal pendant. At the appointed time on the wedding day, the Tholan the best man), the bride’s brother, with a following of relatives made up of wedded pairs, sets off for the groom’s house. There, he places the thalaipa (turban) on the groom’s head and escorts him to the wedding hall accompanied by the groom’s family, relatives and friends. The wedding commences with the arrival of the groom and his retinue at the wedding hall. 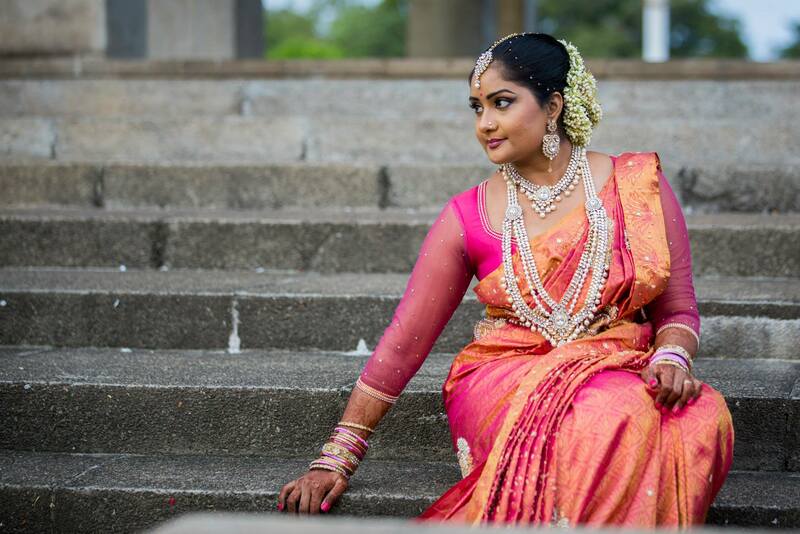 the Tholi (the bride’s maid), the groom’s married sister, bears the Koorai (the bridal saree) and the Thaali. at the entrance to the wedding hall, which represents the bride’s residence, her parents welcome the groom with the flower garland. The Tholan wets the groom’s feet with the Chempu (a bronze vessel) of water, a gesture lavished on an honoured guest, and he in in return rewarded with a gold ring for his good grace. Two ladies representing the bide and the groom perform Aarathi to ward off the evil eye with banana-wick lamps on a tray. Thereafter, to the accompaniment of Nathswaram ( a wind instrument) and Thavil ( a percussion instrument) the Tholan and the bride’s parents lead the groom to the Manavarai, the flower festooned nuptial seat, where the priest awaits to perform the ceremony. To Mount Kailash for Shiva’s grace.Tread three circles round the Lord;Be blessed for this, his divotee mode. Ushered before his benign calm Bhringi paused for there he found Shiva with Shakthi wrapped in arm, Worship woman, was he bound! Bhringi would turn a tiny bee To fly a course between the waists, Only the Lord to circle, d’you seel, Canny glee Shiva spied in sages’s eyes. Shiva smiled, edged, and snuggled She,Lo they fused! Sheiva half, Shakthi half,Late it dawned to humble sage He and she make one eternal. On the auspicious hour, the priest sprinkles holy water sanctifying the ceremonial area. He then performs the Pillaiar Poosai, a prayer to Lord Ganesha, invoking his blessings and protection for the wedding to take place without any unforeseen hindrances. To enlist divine protection from the unforeseen, the priest gives the groom a Pavithram, a ring of Thetpai (a grass), and a Kaapu made of saffron thread to be worn on his wrist. The bride now enters the ceremonial area, bejewelled, in shimmering silk and floral hairdo, accompanied by the Tholi, flower girls and ladies-in-waiting. The Tholan makes way to stand by and the bride sits on the groom’s right. The priest repeats the Pavithram and Kaapu ritual for the bride. Next is the Shiva Paarvathi (shakthi) Poosai, the enactment of the Shiva-Paarvathi wedding or the Thirukkalyanam, followed by the Navakiraka ( 9 planets) Poosai invoking the blessing of the nine holy planets. The sacred fire, omum, is now lit invoking deity Agni to bear witness to the marriage – Agni Chatchi. 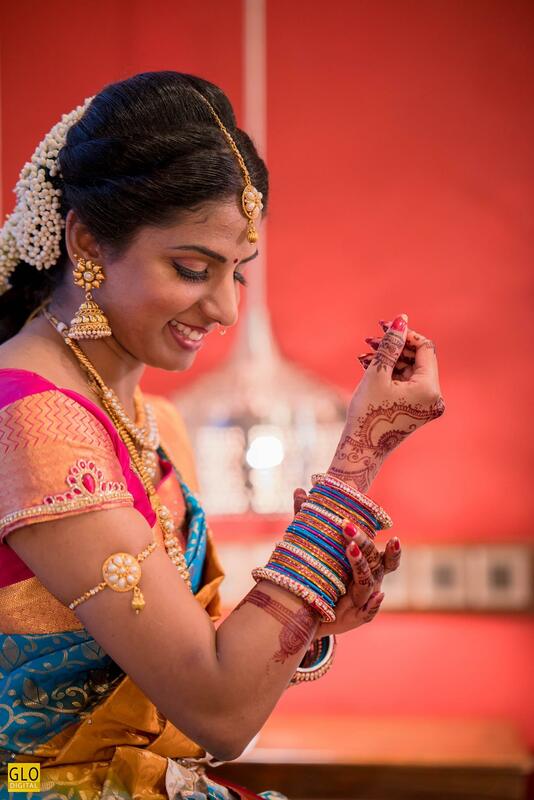 The Kannika Thanam ritual is the bride’s parents giving their daughter’s hand in marriage to the groom making her also a member of the groom’s family. The priest calls the parents of the bride and the groom to the Manavarari. Ravi’s father being deceased, his maternal aunt and her spouse act for his parents. The priest pronounces the names of three generations of male forebears, both living and dead, of the bride bride and groom inviting them to bear witness to the marriage and bless the couple. The bride’s father, betel and coconut in hand, places his daughter’s hand in the groom’s hand indicating that the groom accept cherish and protect her all through life. The bride’s mother indicates her consent by trickling water into hands of her husband, who gives a gold coin to the groom symbolic of giving away the bride. The groom accepts the coin and in turn gives it to his parents. This signifies the acceptance of the bride by the groom and his family. The groom then presents the Koorai and the Thaali to the bride and welcomes her into his family. Before presenting these to the bride, they are blessed by the priest and are taken around in a tray to be blessed by the elders in the congregation. 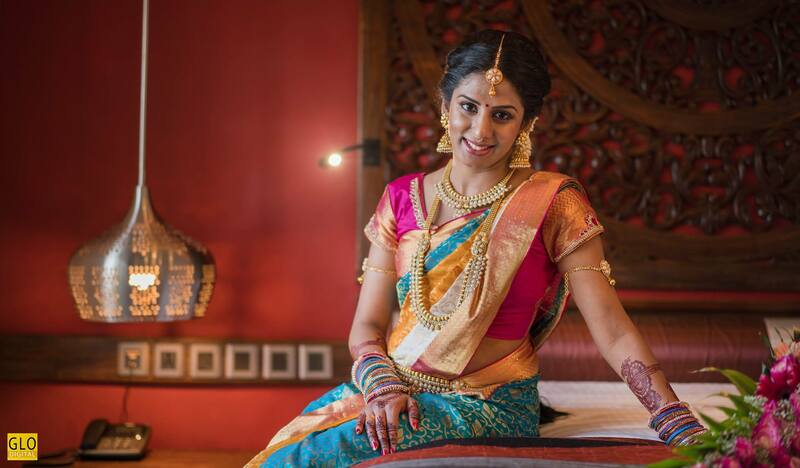 The bride now leaves the Manavarai and retires to her bridal boudoir. She then returns to the Manavarai, dazzling in her gold braided Koorai, and garlands the groom expressing thus her consent and acceptance. Agni, the god of fire, is central to most Hindu rites. Tradition has it that marriages be solemnized in his presence. Here he stands as the universal witness to the union. – Agni Chaatchi. accompanied by the Tholan and Tholi, the bride and groom take their first steps as man and wife to walk clockwise three times around the sacred fire to pay their respect to Agni, the representative of the gods. Certain rituals are performed while going around the fire. At this moment the groom also is reminded that he remains chaste and faithful. This the priest does by drawing his attention to a muslin wrapped green branch of a Mulmurukku, a tree with a myriad of oval thorns (here substituted by a stick) planted in a clay pot in front of the Manavarai. The thorns signifies the thousand eyed spectacle, Indra, the King of Heaven, was transformed into by the curse of sage Gautama for Indra’s tryst with the beautiful Ahaliha, the sages wife. This is a grim reminder of the price Indra paid for his indiscretion. Ahaliha turned by her husband’s curse into a stone for her infidelity regains her human form purified and resplendent when the divine Rama, on his way to Mithila, treads on it. This is the significancve of Ammi Mithithai, the couple performed when they first circled the Omum. Mothiram Eduthal or finding the ring contest between the bride and the groom comes at the end of the third round. This provides for a lighter moment eliciting giggles and chuckles as fingers play and flounder for the ring in the privacy of the pot. 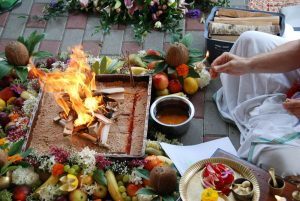 Next, the couple perform the Poorna Ahuthi which is the offering of grains, honey and fruits to the gods through their representative Agni, in attendance as Omum, the sacred fire, imploring them to bless and render their wedlock holy. The crowning stage of the wedding is the Thaali ceremony. Thaali, a gold talisman with embossed sacred signs strung on a Kodi (a gold chain) is a cherished ornament a wife wears next to her heart while her husband lives. To begin the Thaali ceremony, the priest calls for Kettimelam, Thavil accompanied by Nathaswaram rising to a crescendo, to drown utterances for chatter of a house lizard that may spell Abasakunam or bad omen. The groom stands and ties the Thaali-Kodi (Thaali – chain) around the bride’s neck and with a finger spots her forehead with Kunkuma (vermillian dust) the red dot being called Kunkum-Pottu, another symbol of a married Hindu woman. Simultaneously a shower of flowers blesses the couple. The priest holds high a lit oil lamp symbolizing the divine light witnessing the nuptial knot. Also now a coconut is cracked into two halves by a close member of the family symbolizing a bloodless sacrifice. The sweet coconut water signifying love, the white kernel purity and the broken shell selfishness shed. The wedded couple now exchange garlands and the groom moves to accommodate the bride on his left, Shakthi’s place beside Shiva and also the left half she is seen in the Arthanareewara vadivam. They also feed each other a mouthful of elixir, a mix of fruit, milk and honey, as a promise of sweet and endless love they hope to share. From this point the bride becomes a Sahatharmini, an equal partner in the discharge of social duties and the attainment of their spiritual objectives. The priest first blesses the couple, showering them with rice, a symbol of happiness, prosperity and fertility, followed by the parents of the groom, the bride, their close relatives and the guests. The wedding ceremony ends with an Arathi as the newlyweds stand at the Manavarai.